Intelligence Minister Yuval Steinitz said Thursday that military action against Iran is an option if all else fails. As Iran and the P5+1 world powers struggle to eke out a deal on Tehran's nuclear program in Switzerland, Israel says it will do everything possible to prevent a nuclear Iran. 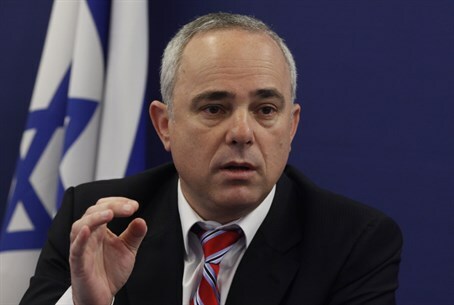 Speaking on public radio Thursday, Intelligence Minister Yuval Steinitz (Likud) said that all options were on the table in the face of the threat of a nuclear-armed Iran. This, he added, includes military action. Iran has repeatedly called for Israel's destruction. Most recently on Tuesday, senior Iranian military official, Brigadier General Mohammad Reza Naqdi, said "Israel's destruction is non-negotiable" and that the Jewish state should be "wiped of the map." Additionally, as noted by Defense Minister Moshe Ya'alon (Likud), while he toured the Golan Heights on Thursday, Iran has been opening a terrorism front against the Jewish state with the placement of its Revolutionary Guards and Lebanese terror group Hezbollah. Steinitz said Israel would seek to counter any threat through diplomacy and intelligence but "if we have no choice we have no choice... the military option is on the table." When asked about possible US objections, Steinitz named Israel's attack against the Osirak nuclear reactor in Iraq in 1981. "This operation was not carried out in agreement with the United States." According to Steinitz, there was no doubt as to what Prime Minister Binyamin Netanyahu's response would be to a nuclear armed Iran. "The Prime Minister has said clearly that Israel will not allow Iran to become a nuclear power." Indeed, Netanyahu, the leader of Steinitz's Likud party, criticized international powers on Wednesday for softening their stance on Iran's nuclear program. "The concessions offered to Iran in Lausanne would ensure a bad deal that would endanger Israel, the Middle East and the peace of the world," he stressed. "Now is the time for the international community to insist on a better deal." The Prime Minister added that Iran must "stop its threats to annihilate Israel. That should be non-negotiable and that's the deal that the world powers must insist upon."